The 40th anniversary of the first spacewalk by a woman will be marked on July 25. As London’s Science Museum gears up to open a landmark exhibition about Russian Space travel, RBTH talked to staff at the museum about pioneering, cosmic achievements from the Soviet era. During the colourful opening ceremony of the Winter Olympics in Sochi earlier this year, five cosmonauts raised the Russian flag as the Sretensky Monastery choir sang the national anthem. 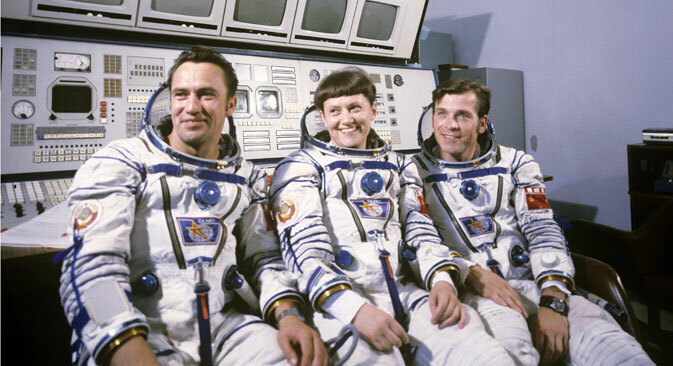 Among them was the first woman to walk in space, Svetlana Savitskaya. This month, it will be 40 years since she spent three and a half hours cutting and welding metal outside the orbiting Salyut 7 Space Station. Visitors to London’s Science Museum can hear Savitskaya’s extraordinary story recreated by actress Imogen Lucy Tranchell. The setting could hardly be further from the pomp and power of Sochi. At one end of a third floor gallery dedicated to 18th century inventions, Tranchell, in a spacesuit, is trying to finish her homemade sandwiches before the next group of seven-year-olds turns up to hear about her cosmic adventures. Savitskaya’s journey still has an inspirational power. Born in Moscow in 1948, her father was a Soviet air commander and her lifelong dream was to follow him into flight. She began to train secretly as a parachutist and then became an aerobatics expert; the British press dubbed her “Miss Sensation”. A 1962 NASA rejection letter circulated recently online, telling a woman who wanted to be an astronaut: “We have no existing program concerning women astronauts nor do we contemplate any such plan.” Soviet cosmonaut, Valentina Tereshkova became the first woman in space the following year. “Some groups know very little about the importance of the Soviet space programme and what was achieved,” says Rayner. Today’s audience, from a North London primary school, still think Neil Armstrong was the first man in space. Savitskaya/Tranchell throws her hands up in mock horror and makes them repeat “Yuri Gagarin” until they remember his name. A statue of Gagarin was recently installed near the Greenwich Observatory, giving the cosmonaut due prominence in a museum about space. The Science Museum’s display about Gagarin, downstairs in the space exploration galleries, also dates only from 2011, the fifty-year anniversary of the cosmonaut’s spaceflight; the foil-covered, American lunar module nearby has been there for decades. Anthony Richards, Head of Learning Operations at the Science Museum, told RBTH that the museum developed the presentations about Russian cosmonauts two years ago “partly to balance the story … We had all these American artefacts, but it made it look as though only the Americans have made it into space.” Tereshkova has actually visited the museum and Richards describes her as a “fearsome woman”. With help from Russian-speaking friends, Tranchell has perfected her accent, which has a “lovely musicality”. She is so convincing that most of the students and many of the teachers believe they are actually meeting Savitskaya and “lots of Russians start talking to me in Russian”. Tranchell visited the Soviet Union herself on a “Youth Peace Tour” as a teenager and remembers epic war memorials, friendly pioneer camps and “a watermelon party on the beach at Sochi”. Rayner observes that having real people playing scientific figures introduces “a human dimension that people can relate to”, making concepts “more meaningful”. During Savitskaya’s monologue, the children prove the existence of gravity, learn about the atmosphere and take part in a recreation of the spacewalk. In November this year, the Science Museum will unveil a landmark exhibition about Russian space travel, featuring “real, cosmonaut-flown spacecraft, pioneering rocket engines, space suits and … memorabilia belonging to some of the biggest names in spaceflight”. The Science Museum’s Julia Murray told RBTH they have been formally developing this exhibition since 2011, but the idea behind it “has been simmering for 20 years”. “The response to our plans has been very enthusiastic so far,” says Murray, “and we are anticipating huge interest from the public.” The museum has worked with numerous organisations and individuals, including Moscow’s State Cosmonautics Museum and Russia’s Federal Space Agency, Roscosmos.